Background: Myelosuppression is one of the frequent side effects of chemotherapy in breast cancer patients. Granulocyte-colony stimulating factor (G-CSF) and pegylated G-CSF are used for the prevention of neutropenia after chemotherapy. Pegylated G-CSF has longer half-life of action and can be used as a single dose in comparison to G-CSF. The aim of this study is to compare the grade of cytopenia and side effects between G-CSF and biosimilar pegylated G-CSF in breast cancer patients treated with dose-dense chemotherapy. Materials and Methods: In the cross-over clinical trial study, 24 women with breast cancer were randomly divided into two groups and treated with dose-dense chemotherapy. The first group was treated with single dose of 6 mg biosimilar pegylated G-CSF 24 h after the first course of chemotherapy and the second course was followed by 300 μg daily injection of G-CSF for 6 days. The chemotherapy regimen was combination of doxorubicin 60 mg/m2 and cyclophosphamide 600 mg/m2. The second group was treated with G-CSF after the first course and pegylated G-CSF after the second course. Cell blood count (CBC) and side effects were evaluated 1 and 2 weeks after both courses of chemotherapy. Results: In this study, no significant carryover effect and treatment effect about the CBC parameters was found between pegylated G-CSF and G-CSF. Patients who were treated with biosimilar pegylated G-CSF had significantly higher side effects such as bone pain (P = 0.09) and gastrointestinal effects (P = 0.005) in comparison to G-CSF. Conclusion: G-CSF and biosimilar pegylated G-CSF are effective in reducing cytopenia in breast cancer patients treated with dose-dense chemotherapy, but side effects induced by pegylated G-CSF (Pegagen) are higher. Filgrastim (r-metHuG-CSF) is used to stimulate the production of granulocytes, improve the function of mature neutrophil, and consequently ameliorate neutropenia. The half-life of filgrastim action is 3–4 h and must be used daily. Pegfilgrastim or generic pegylated granulocyte-colony stimulating factor (G-CSF) is a pegylated form of filgrastim with a longer half-life of 15–80 h. Because of the generic pegylated G-CSF's longer period of action, it can be used as single dose, offering an advantage over the daily administration of G-CSF. Moreover, fewer injections lead to higher compliance of generic pegylated G-CSF over G-CSF. Administration of pegfilgrastim in the breast cancer patients was evaluated in the study by Invernizzi et al. Pegfilgrastim increased neutrophil numbers in patients treated with dose dense chemotherapy and prolonged neutrophil survival and neutrophil functions. In one study, no significant difference was found between filgrastim and pegfilgrastim among the patients receiving hyper-CVAD chemotherapy. Furthermore, a single injection of 100 μg/kg pegfilgrastim was similar to daily filgrastim in absolute neutrophil count (ANC) in patients receiving a myelosuppressive chemotherapy regimen. The single-dose injection of generic pegylated G-CSF offers an advantage over G-CSF which should be administrated in multiple daily dose. However, the grade of neutropenia and other adverse reactions of these two treatments have not yet been compared in a cross-over pattern. In this study, we compare the grade of neutropenia and side effects induced by G-CSF and biosimilar pegylated G-CSF in the breast cancer patients who treated with dose-dense chemotherapy. The results of this clinical study will help the clinicians to choose the more effective treatment for the prevention of cytopenia in breast cancer patients. In a cross-over clinical trial study, we consecutively recruited breast cancer patients from the hematology outpatient service in Isfahan Al Zahra Hospital and Omid Hospital from March 2015 until October 2016. The sample size was estimated in the current study considering type I error rate 0.05, statistical power 0.80 for detecting the effect size of 6% based on febrile neutropenia to be 24 patients. Inclusion criteria were women older than 18 years with newly diagnosed breast cancer, ANC ≥1.5 × 109/l; platelet count ≥100 × 109/l; serum creatinine <1.5 × upper limit of normal; normal liver function tests; and chemotherapy regimen being dose-dense AC-T.
Exclusion criteria were any change in chemotherapy regimen, allergic reactions, and patient unwillingness. Consent form was obtained from all participants, and the needed information about the study was given to patients before participating. This study was approved by the Research Council and Ethics Committee of Isfahan University of Medical Sciences (No: 395546). Registration code on IRCT is IRCT2017020732444N1. Twenty-four women with newly diagnosed breast cancer were treated with dose-dense chemotherapy regimen that was combination of doxorubicin 60 mg/m 2 and cyclophosphamide 600 mg/m 2. The patients were assigned into two groups randomly. Consort diagram is shown in [Figure 1]. The first group was given single dose of 6 mg biosimilar pegylated G-CSF (Pegagen, CinnaGen Company, Iran) 24 h after the completion of the first course of chemotherapy, and the second course of chemotherapy was followed by daily subcutaneous injection of 300 μg G-CSF (Zarxio, Sandoz company) for 6 days. The second group was treated with G-CSF after the first course of chemotherapy and was given biosimilar pegylated G-CSF following the second course. The parameters evaluated in the patients before and 1 and 2 weeks after the chemotherapy were white blood cell (WBC) count, ANC, hemoglobin, platelet count, adverse effects such as fever, bone pain, dyspnea, and gastrointestinal (GI) effects, and incidence of febrile neutropenia and hospitalization. Analysis of data was done with SPSS 23 (Armonk, NY, USA: IBM Corp). Quantitative and categorical data were presented as mean ± standard deviation and frequency (percentage). Categorical data were compared between groups with Chi-square test and quantitative data with independent samples t-test as well as analysis of variance in the framework of cross-over design. P < 0.05 was considered as statistically significant. A total of 24 patients were evaluated in this study. Demographic characteristics of the patients and mean cell blood counts (CBCs) before chemotherapy are shown in [Table 1]. One week and 2 weeks after the first course of chemotherapy, CBC was monitored and the results are shown in [Table 2]. One week after chemotherapy, mean level of WBC in the first group treated by G-CSF was 5149 and in the second group treated with pegylated G-CSF was 4556 (P = 0.34). Two weeks after chemotherapy, the second group had significantly higher level of WBC, neutrophil, and ANC. The mean WBC count was 9311 in the second group and 4422 in the first group (<0.001). Therefore, pegylated G-CSF treatment leads to a higher protection against neutropenia 2 weeks after the first course of chemotherapy. The same blood parameters were monitored after the second course of chemotherapy [Table 3]. No significant difference was found between the blood parameters of the two groups, either after the 1st week or the 2nd week. Mean difference of CBCs in each course of chemotherapy was compared between patients who received Pegagen and G-CSF in a cross-over analysis with equivalence test for 2 × 2 cross-over design. 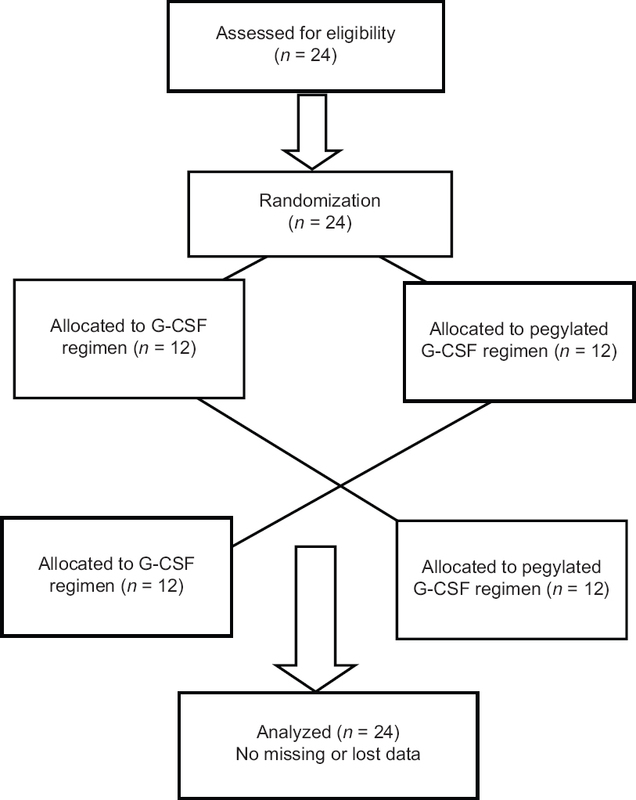 Cross-over analysis of variance showed that there was no significant difference between G-CSF-treated and pegylated G-CSF-treated patients about CBC parameters [Table 4]. Adverse effects were also evaluated in both courses of chemotherapy. The total side effects of biosimilar pegylated G-CSF (the first round of the first group plus the second round of the second group) were compared with the total side effects of G-CSF (the second round of the first group plus the first round of the second group). It is shown in [Table 5] that biosimilar pegylated G-CSF resulted in GI side effects such as nausea and abdominal pain (29.2%), bone pain (20.8%), and fever (4.2%), while patients who were treated with G-CSF did not show any side effects. One of the generic pegylated G-CSF-treated patients had fever and severe neutropenia after chemotherapy that caused a dose reduction in the second round of the chemotherapy regimen. In this study, we compared the efficiency and side effects of biosimilar pegylated G-CSF and G-CSF in breast cancer patients. Both groups of patients underwent two rounds of chemotherapy followed by generic pegylated G-CSF and G-CSF treatments in a cross-over trial. No severe neutropenia was found and chemotherapy sessions were not interrupted. We showed that generic pegylated G-CSF-treated patients had significantly higher side effects such as bone pain and GI side effects. Fever and chemotherapy dose reduction were also reported in this treatment. Neutropenia has been compared between fixed-dose single-administration pegfilgrastim versus daily filgrastim in patients receiving myelosuppressive chemotherapy. It is shown that a single fixed dose of 6 mg of pegfilgrastim and multiple daily doses of filgrastim provide similar efficacy in controlling neutropenia and identical safety profiles. In contrast to this study, our results show that the safety level of G-CSF is higher compared to biosimilar pegylated G-CSF. Pegfilgrastim and G-CSF have also been prescribed and compared to other types of cancer, such as lymphoid malignancy. The duration of Grade 4 neutropenia, incidence of febrile neutropenia, and delay in the next cycle of chemotherapy were compared after administration of pegfilgrastim and G-CSF in the patients who were treated with hyper-CVAD chemotherapy, and no significant difference was found. Side effects were not increased in pegfilgrastim in comparison to G-CSF and once per cycle dosing of pegfilgrastim was as safe and effective as G-CSF. Samaras et al. showed that time to engraftment, length of hospital stay, or the need for blood products and intravenous antibiotics was not significantly different between pegfilgrastim and filgrastim in patients with Hodgkin's and non-Hodgkin's lymphoma who underwent chemotherapy. In contrast to previous studies,,, our results show that the safety level of G-CSF is higher compared to biosimilar pegylated G-CSF. However, neutrophil count, 2 weeks after the first course of chemotherapy, was higher for the patients who received pegylated G-CSF. Our findings are in line with the findings of Skarlos et al. where it was shown that the rate of febrile neutropenia was significantly higher in breast cancer patients who received pegfilgrastim than G-CSF. G-CSF and biosimilar pegylated G-CSF are effective in reducing cytopenia in breast cancer patients treated with dose-dense chemotherapy, but side effects induced by pegylated G-CSF (Pegagen) are higher. Enayatrad M, Amoori N, Salehiniya H. Epidemiology and trends in breast cancer mortality in Iran. Iran J Public Health 2015;44:430-1. Jemal A, Siegel R, Ward E, Hao Y, Xu J, Murray T, et al. Cancer statistics, 2008. CA Cancer J Clin. 2008;58:71-96. Webster J, Lyman GH. Use of G-CSF to sustain dose intensity in breast cancer patients receiving adjuvant chemotherapy: A pilot study. Cancer Control 1996;3:519-23. Green MD, Koelbl H, Baselga J, Galid A, Guillem V, Gascon P, et al. A randomized double-blind multicenter phase III study of fixed-dose single-administration pegfilgrastim versus daily filgrastim in patients receiving myelosuppressive chemotherapy. Ann Oncol 2003;14:29-35. Morstyn G, Campbell L, Souza LM, Alton NK, Keech J, Green M, et al. Effect of granulocyte colony stimulating factor on neutropenia induced by cytotoxic chemotherapy. Lancet 1988;1:667-72. Available from: https://www.cinnagen.com/Product.aspx?t=2&l=1&Id=57&f=3. [Last accessed on 2018 Apr 07]. Invernizzi R, Grasso D, Travaglino E, Benatti C, Collovà E, Manzoni M, et al. Biological effects of pegfilgrastim on circulating neutrophils in breast cancer patients undergoing dose-dense chemotherapy. Oncology 2008;75:237-44. Lane SW, Crawford J, Kenealy M, Cull G, Seymour JF, Prince HM, et al. Safety and efficacy of pegfilgrastim compared to granulocyte colony stimulating factor (G-CSF) supporting a dose-intensive, rapidly cycling anti-metabolite containing chemotherapy regimen (Hyper-CVAD) for lymphoid malignancy. Leuk Lymphoma 2006;47:1813-7. Holmes FA, Jones SE, O'Shaughnessy J, Vukelja S, George T, Savin M, et al. Comparable efficacy and safety profiles of once-per-cycle pegfilgrastim and daily injection filgrastim in chemotherapy-induced neutropenia: A multicenter dose-finding study in women with breast cancer. Ann Oncol 2002;13:903-9. Schippinger W, Holub R, Dandachi N, Bauernhofer T, Samonigg H. Frequency of febrile neutropenia in breast cancer patients receiving epirubicin and docetaxel/paclitaxel with colony-stimulating growth factors: A comparison of filgrastim or lenograstim with pegfilgrastim. Oncology 2006;70:290-3. Samaras P, Buset EM, Siciliano RD, Haile SR, Petrausch U, Mischo A, et al. Equivalence of pegfilgrastim and filgrastim in lymphoma patients treated with BEAM followed by autologous stem cell transplantation. Oncology 2010;79:93-7. Skarlos DV, Timotheadou E, Galani E, Samantas E, Grimani I, Lianos E, et al. Pegfilgrastim administered on the same day with dose-dense adjuvant chemotherapy for breast cancer is associated with a higher incidence of febrile neutropenia as compared to conventional growth factor support: Matched case-control study of the Hellenic Cooperative Oncology Group. Oncology 2009;77:107-12.